An ideal relationship is not a sacrificing of the self for another, but a greater affirming of our own individuality and purpose. It is asking “who am I in relationship to you? And are we each living a grander and more balanced life because of it?” These two separate paintings symbolize lovers sharing the same life journey, yet simultaneously retaining their deep sense of self. 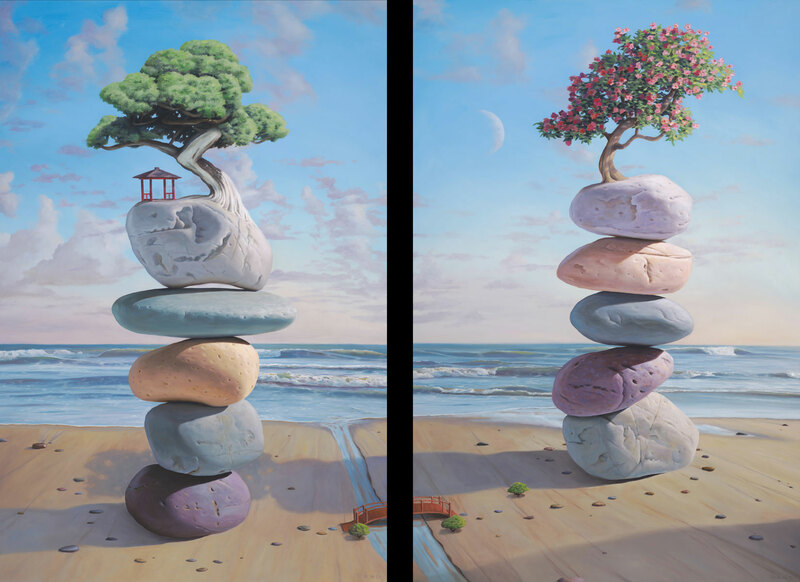 It also represents the male and female essence of a couple: the masculine on the left with its created structure and tree of tenacity; and the feminine on the right – flowering beneath the matriarchal moon. Both are connected by a simple bridge. An open invitation to traverse at anytime.